Thanksgiving, known colloquially as “turkey day,” will finally arrive later this week and we’ve decided to write a special three part series that will provide all readers with truly unique prospectives about America’s favorite holiday bird. Note that every day is turkey day in one form or another here at the Valhalla Project. Like most living and non-living things here our turkeys are multi-taskers of the first order, and we’ll bet for roles you may not have thought of before. They are wonderful for dinner all right (our original intent as part of our homesteading programs for veterans), yet over the last three years they have also managed to accidentally become very unique therapy birds. Project, our birds regularly volunteer to de-stress visiting veteran participants. From the outset we had the notion that the presence of domestic farm animals and birds would be a relaxing, distracting factor for our participants. We didn’t realize until we saw it first hand just how important these creatures could be. hens. The rest of the flock hid behind his car. Understand that few veterans have much, if any, experience with poultry aside from the plastic wrapped stuff in supermarkets or the “parts is parts” mystery meat in fast food outlets. In contrast, Valhalla’s birds are relatively free spirits. During the day our birds have the run of the grounds, scratching and foraging for seeds and insects and generally getting involved in anything and everything going on. Most are intensely curious and several are especially attracted by what the humans are up to at the moment. Caution: if you visit, you will be welcomed enthusiastically. Part of the Valhalla routine is that everyone relaxes and everyone participates. 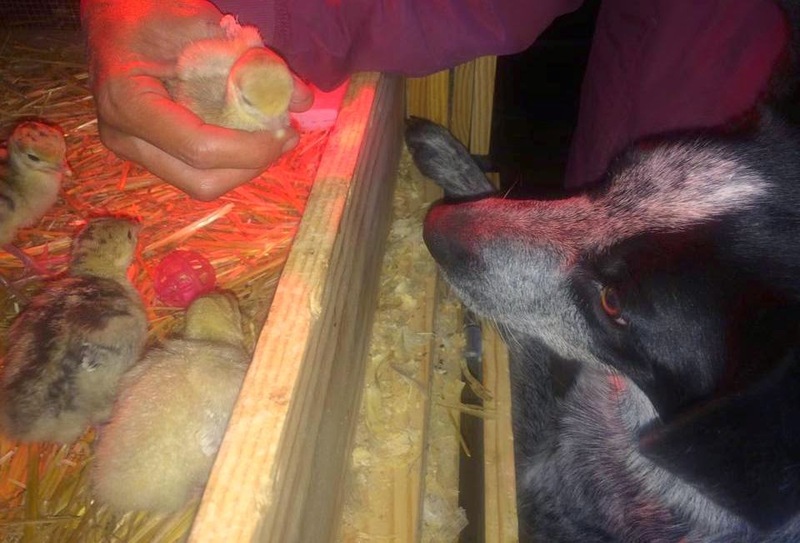 Twice-daily “chores” revolve around releasing and feeding all the birds and animals in the morning, then feeding and securing them for the night before dark. In practical terms this means that all birds and animals have as a minimum a health inspection a couple of times a day. Valhalla participants accompany us the first few times to learn the routine – more critical for the critters than for humans, as they like a fixed routine and get nervous with too much deviation. Almost without exception all Valhallans quickly realize two important things: the livestock and poultry are absolutely dependent on us for water, food, bedding, and health. When that sinks in it is inevitable that each veteran develops a fondness for their charges. Before too long they pick favorites and look for excuses to visit and play with them during the day. It’s a normal thing here for veterans to get up earlier than we do so that they can “beat us” out to chores just to have the private interaction with all their fans. And as much as the Valhallans pick their favorites, the birds certainly reciprocate. One or more will attach themselves to a vet – call it chemistry, attitude, or a sense of mutual need – and begin to seek him or her out. 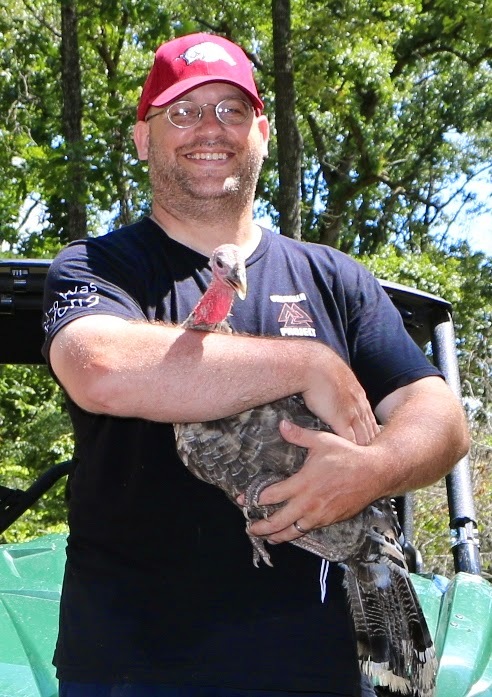 A female Army vet who was stressed out by her work and decided to relax in a camp chair under a shade tree was initially surprised when Chris casually handed our turkey Blindgai to her. “Pet her,” Chris directed. The vet was a bit nonplussed as she had never actually held a turkey before now. “Pet her,” Chris said. “She’s mostly blind – a very special case – and she just loves being petted.” Somewhat reluctantly the vet did as told. A few minutes later, when pausing in our activities, we noticed that both Blindgai and the vet were sound asleep in the chair under the tree. The lesson is that petting a turkey is very relaxing and a hell of a lot better than taking a pill. “I had no idea that they could be this friendly.” We hear that comment repeatedly not only from veteran participants but also from visitors. Typically the birds will come up and explore out of curiosity then linger to interact. Many simply want to be picked up and petted. and needs of combat veterans. Sometimes the reception gets, shall we say, overenthusiastic. 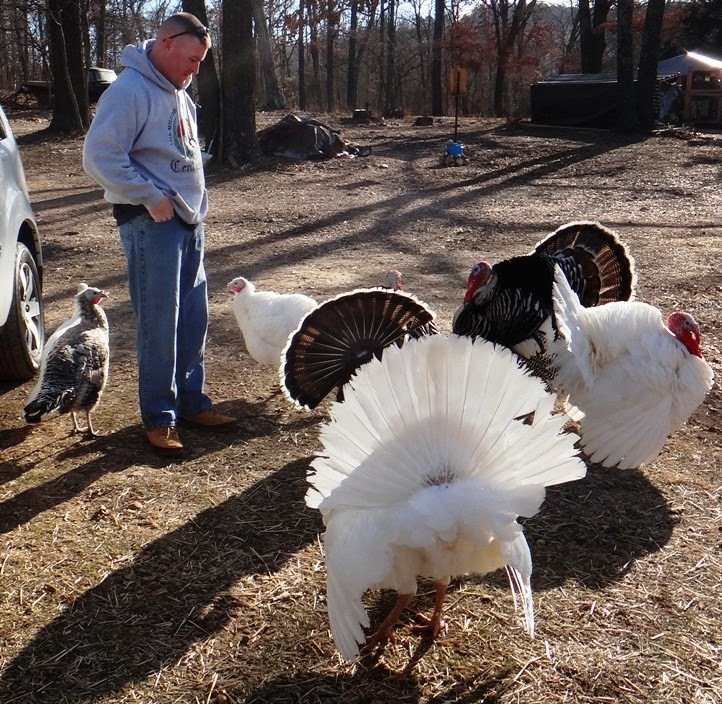 Our regular FedEx delivery lady, herself a country gal, was startled to see the excitement that the reflective stripe down her trouser leg generated among the turkeys. Perhaps because turkeys can see wider on the light spectrum than humans, that stripe definitely got their attention. You could see the gleam in their eyes as they raced over to explore this wonderful color – by pecking at it, of course. Panicked, the delivery lady raced back to the safety of her van. Whoops, big mistake. Once the turkeys learned that they could play chase with her then every time she arrived to deliver a package they descended like a wolf pack, determined to dash after her as she ran. What a neat game! of lemonade from her own glass. The turkeys’ next favorite game is “climb on the new car.” Within minutes of someone parking in the clearly designated spaces the turkeys are there in force seeing how high up on the top they can fly and wandering all over, occasionally leaving rather unpleasant tokens of their visit. Whenever a really nice new car or truck pulls in Chris desperately lunges for a tarp to protect it from turkey damage. 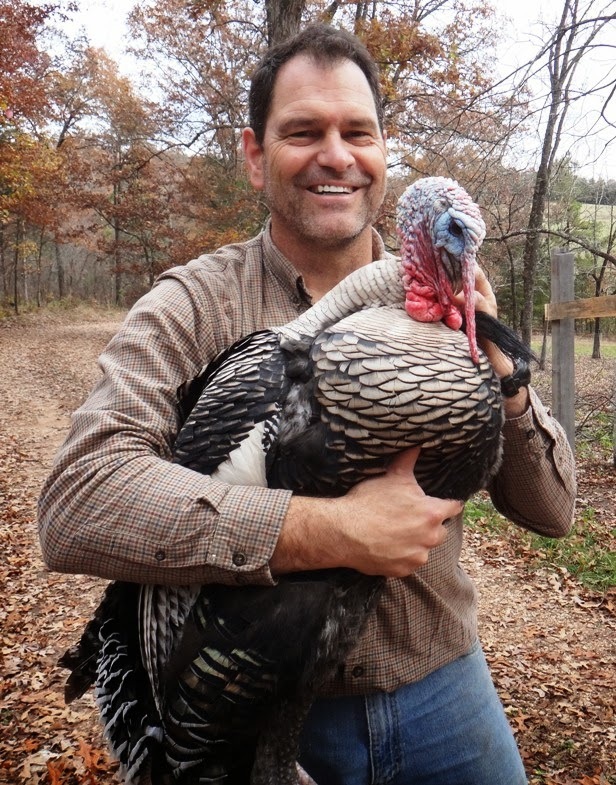 So now we’ve seen the turkeys acting like…well, happy birds who like people. In the second installment tomorrow (two days before Thanksgiving of course) we’ll check out some other roles they play here at Valhalla Project.